Former Russian security agent Alexander Litvinenko may have been poisoned with "radioactive thallium", the toxicologist treating him disclosed today. John Henry said the damage to Mr Litvinenko's bone marrow and his blood cells suggested a radioactive element to the poisoning. Speaking outside University College Hospital in London, where the former security agent is receiving treatment in intensive care, Professor Henry said it was possible that "radioactive thallium" had been used. "The thallium is the least of it - the radioactivity seems more important," he said. "He may need a bone marrow transplant to get him better." London – Former Federal Security Service (FSB) Colonel Alexander Litvinenko, a vocal critic of the Kremlin, has apparently been poisoned with traces of the toxic metal thallium. Tonight the 41 year-old Russian exile is being treated in the intensive care unit of London's University College Hospital, and the staff has added extra security for Litvinenko's protection. Litvinenko is being fed intravenously, and has lost nearly all of his hair. Doctors treating him say his white blood cell count is down to nearly zero. This high profile poisoning case has drawn comparisons in Western media outlets to the dioxin poisoning of Viktor Yushchenko, shortly before he was elected President of Ukraine in 2004. Litvinenko became violently ill following a meeting on November 1 with a man who claimed that he had information on the murder of the Russian journalist Anna Politovskaya. Litvinenko met his contact, an Italian academic named Mario Scaramella, at the Itsu sushi restaurant near London’s Picadilly district. Mr. Scaramella, an expert on the history KGB and FSB spy activities in his native Italy, contacted the British Embassy in Rome when he found out about Litvinenko’s illness. He is now in hiding and seeking protective custody as a material witness to the crime. Mr. Litvinenko told his friend Alex Goldfarb that he had met two Russian men for drinks shortly before his sushi lunch, and had described the suspects to the London police. One of the suspects was unknown to Mr. Litvinenko, and it is still unclear why he agreed to meet with the two men. Litvinenko is best known in the West as the author of Blowing Up Russia: Terror from Within. In his book, co-authored with the Russian historian Yuri Felshinsky, Litvinenko accuses the FSB of planting bombs in several Moscow apartment buildings in 1999 as part of a plot to blame the explosions on Chechen terrorists. The wave of bombings sparked the Second Chechen War. In 2004, two Chechens, Adam Dekushev and Jusuf Krymshankhalov, were convicted by a Moscow court of planting the explosives in the apartment blocs. Russian prosecutors claimed that the bombers were trained by the Saudi jihadist Ibn Khattab, who was later killed by Russian security forces. In a 2002 interview with Echo Moskvy radio, Litvinienko claimed that he had been in contact with a third Chechen suspect wanted for his alleged role in the attacks, Achemez Gochiyayev. According to Litvinenko, Mr. Gochiyayev affirmed his innocence and blamed FSB agents for the bombings. Litvinenko resigned as a Lieutenant Colonel from the FSB in the mid-1990s, alleging that his superiors in the newly formed security service had ordered him to kill the oligarch Boris Berezovsky. At that time, Berezovsky had become the first billionaire in Russia and acquired enormous influence in President Yeltsin's kitchen cabinet of advisors known as "the Family". By the late 1990s, Litvinenko faced multiple counts of prosecution for divulging state secrets and sought political asylum in Great Britain. He joined a circle of émigrés that included Berezovsky, the legendary KGB defector Oleg Gordievsky, and the chief spokesman for the “Chechen resistance”, Akhmed Zakayev. Litvinenko has been a persistent critic of the Russian government for several years. After Anna Politovskaya was murdered on October 7, he accused Putin of personally ordering her death. For his part, Berezovsky has claimed that only security services like the FSB have access to the toxic thallium compound that was used to poison Litvinenko, though the doctors on the case have told reporters that thallium compounds can be found in some types of rat poison sold outside of the UK. Both the Russian Embassy in London and FSB spokesmen in Moscow have strongly denied any involvement in the crime. Sky News quotes Kremlin spokesman Dimitri Peskov dismissing accusations against the Russian security services: "Claims originating in London are bordering on stark raving madness and are not worthy of the Kremlin's official reaction." 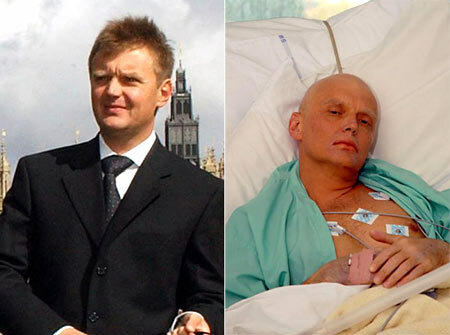 Dramatic change: Mr Litvinenko before and after the attack. Click to enlargeFormer Russian security agent Alexander Litvinenko may have been poisoned with "radioactive thallium", the toxicologist treating him disclosed today. I imagine you wrote about him, do you have a link? I haven't yet, though I've quoted a few times from Blowing Up Russia. I mean to post something on the blog about him tonight. Thanks for the thread, seems. This article is unbelievably bizzare. Since whend did spies start giving press conferences and publicly announcing the locations of their regular drops? The story just continues to warp as Litvinenko's associate provides details about a hit list in his possession as well as details regarding informants and contacts. This story is interesting in and of itself but the fact that it is playing out simultaneously along side incidents as problems with Airforce One forcing the president to take alternate transportation and Babs Bush gets mugged in Argentina while under the watchful eyes of her heavy security detail. Whether or not these are all related, they might be worth paying attention to. Three police motorcycle officers were injured when they crashed on slick pavement while escorting his motorcade on Tuesday. Two were taken by ambulance to a local hospital, where one was described as in serious condition and another was described as stable. Members of the White House medical team — including an ambulance — were cut loose from the motorcade to help, said Dr. Richard Tubb, Bush's doctor. Local ambulance and fire units were sent, too. Also, acting White House Travel Office Director Gregg Pitts was beaten and robbed by at least two men while out in Honolulu Monday night. Pitts suffered head and other injuries in the attack. He was awake and alert but remained behind at a Honolulu hospital because of a possible concussion, White House spokesman Tony Fratto said. "What's the Russian Bohemian Grove called? [/b"
I still don't buy Putin's involvement in the Politikovskaya case Possible, of course. Think Hariri assassination. I do think it is quite possible that there is a rogue nationalist element doing things for Putin. Politikovskaya's assassination happened on Putin's birhtday. Check out Russian Godfathers BBC if you can find a copy. Many of these these players have interesting backgrounds. [url=http://www.eurotrib.com/?op=displaystory;sid=2006/11/19/20439/209]So apart from being accused on the one hand of being an FSB agent and on the other of working for the CIA, who - in a more mundane sense - is this mysterious figure called Mario Scaramella, and how well did Litvinenko know him? Berezovsky and his pal Nevzlin among others were instrumental in the Orange 'revolution' in Ukraine. In the documentary you can see them admit their excitement at the success of their designer revolution. "You know you work behind the scenes and do things and suddenly people are in the streets, that's amazing. It's like science you know. We do the experiment in test tubes and a little tinkering and then something big comes out of it." -- Alex Goldfarb, Berezovsky's right hand man. Berezovsky and Neil Bush in Latvia on a trip selling educational software for children. Leonid Nevzlin and pals (all were multi $baires) didn't have the brains amongst them to run a chicken coup let alone multi $b empires. These guys along with Boris are simply stooges for the real power behind the scenes. Guess who? Ownership of Korovdosky's oil company shares automatically transferred to the Rothschild's interests after his arrest and before Putin could sieze them. Who is based in London and controls Israel? Why do Boris and friends hang out there? It seems Boris is the brightest of the lot, at least he can mouth his lines with some conviction and without fumbling. Nevzlin, Duvdov and Brodno stayed at my clients resort for the better part of a week. The majority of that time they were falling down drunk and terrorizing the maids trying to drag them into the sack. They were asked to leave after offending other guests. They tried to skip out on the bill and the owner had to chase them to the airport and drag them back. At least Berezovsky has a little class. This is sounding more and more like the Yushenko poisoning, the story keeps changing. Doctors treating the former Russian spy who is seriously ill in hospital said yesterday that thallium was an "unlikely" cause of his illness after tests found less of the metal in his body than they expected. In an extraordinary twist to the case, the consultant caring for Alexander Litvinenko said the cause of his condition may never be known. The defector remains in intensive care because he has suffered damage to his immune system and has to be isolated to protect him from infection. Dr Amit Nathwani, the consultant treating him at London's University College hospital, said while thallium could not be ruled out, doctors were looking for other causes. "His symptoms are slightly odd for thallium poisoning and the levels of thallium we were able to detect are not the kind of levels you would see in toxicity." Another medical expert who has examined him suggested he may have been poisoned with a radioactive form of thallium, a toxic metal. Mr Litvinenko has symptoms which can only be explained by "something other than thallium", according to John Henry, a clinical toxicologist at St Mary's hospital. The damage done to his bone marrow and the fact that his white blood cells had been wiped out also suggested another factor. "Radioactive thallium adds a new dimension to this case," Mr Henry said. "It means his bone marrow is at very high risk and we have to see how his cells recover. It is very difficult to treat because you have to rely on the body's natural resilience." An associate, Alex Goldfarb, who has visited Mr Litvinenko in hospital every day, said his condition appeared to have worsened yesterday. He said his friend was more exhausted, had become thinner and spoke with more difficulty. "To me, he looks like he is slowly deteriorating," he said. Mr Litvinenko, who defected six years ago and is now a British citizen, had been investigating the murder of the Russian journalist Anna Politkovskaya when he fell ill. Scotland Yard's anti-terrorist branch is looking at two meetings on November 1, the day Mr Litvinenko was poisoned; one was with two Russians at a London hotel and the second with an Italian espionage expert, Mario Scaramella, at a sushi restaurant. Dr Scaramella yesterday emerged from hiding in Rome to give a press conference in a side room of the Italian senate, where he gave an account of their meeting at Itsu in Piccadilly. The Italian, who described himself as a defence consultant, said he wanted to warn Mr Litvinenko about an email hit-list which featured both their names. He also had an email identifying a group of men responsible for the assassination of Politkovskaya. "The information was very disturbing and contained details regarding the security of a group of people in Britain and in Italy. It was four pages long in two emails and it was very detailed." Mr Litvinenko had told him he had another meeting planned in the morning and so they arranged to meet around 3pm. "We went to the sushi bar - we have been there before," Dr Scaramella said. Mr Litvinenko, who ate sushi and soup, said he was not worried about the email. Dr Scaramella, who left the press conference flanked by bodyguards, said: "It's of deep concern to me that anything like this could happen. [Mr Litvinenko] is a professional. He's a well-known analyst and activist." Doctors said that Mr Litvinenko was able to talk, but remained seriously ill. "At the moment he's not getting better, but he's holding up," Mr Henry, who is treating him, said. Asked how the poison was likely to have been administered, Mr Henry said: "In this case his symptoms are gastro-intestinal so the probability is that he has swallowed something that is poisoned." The most likely possibility is that he was poisoned with radioactive thallium, small quantities of which are used by hospitals for heart scans, but he may also have been given a cocktail of poisons including thallium and another radioactive substance. MOSCOW (AP) - A co-owner of a small Russian private bank was gunned down in an apparent contract killing in central Moscow, prosecutors said Wednesday. An unidentified assailant shot Konstantin Meshcheryakov of Spetssetstroibank in the head, neck and torso Tuesday night, said Svetlana Petrenko, a spokeswoman for city prosecutors. A murder investigation has been opened, she said. The ITAR-Tass news agency quoted an unidentified official in the prosecutor's office as saying the crime bore signs of a contract killing. A bank spokeswoman declined comment. Russia has seen a series of contract killings in the banking sector. In October, the head of a branch of the state-controlled Vneshtorgbank was fatally shot in Moscow. The top deputy director of the Central Bank, Andrei Kozlov, was gunned down in the capital in September in a killing widely seen as connected to his efforts to clean up the banking sector. Opened in 1994, Spetssetstroibank is a small private bank that has offices in Moscow and St. Petersburg. Gennady Gudkov is a member of the Security Committee of the Russian State Duma. He contributed this comment to Russia Profile. International media has been abuzz over the attempt on the life of Alexander Litvinenko, a former Russian intelligence officer and a critic of the Kremlin, who defected to Britain six years ago. In recent months Russia itself has seen a number of high-profile murders, leading some to speculate that we are returning to the 1990s. The slayings of Andrei Kozlov, deputy head of the Central Bank, on Sept. 13; journalist Anna Politkovskaya on Oct. 7; and Dmitry Fotyanov, a mayoral candidate in a small town in Russia's Far East, on Oct. 19 ended a long period during which assassinations had ceased to be common in Russia. Just yesterday, Konstantin Meshcheryakov, co-owner of Spetssetroibank, was gunned down in central Moscow, becoming the third Russian banker to be killed in the last two months. Several commentators, both inside and outside the country, immediately said the murders were political and saw them as part of an attempt to destabilize the country. Some even speculated that the killings were ordered by the government in an attempt to get even with some of its opponents. These points cannot all be true at the same time. In the 1990s, assassinations were not a political weapon but rather a way of solving business conflicts. This method is still in use, but the victims are much less well known than those who were killed in the 1990s. What characterizes a typical contract killing in Russia? In the early 1990s, the most frequent victims of ordered hits were officials who had taken on some responsibility to business groups linked to criminal gangs. Frequently the victims simply did not realize the danger they were in when they took on these responsibilities, and were unable to carry them out. Other victims were rivals of businessmen connected with criminal elements who used hired killers to get rid of their competitors or officials obstructing them from taking control of some valuable assets. A common scenario would go like this: the official would promise to help a businessmen sort out a problem and would take money for doing so, but then be unable to follow through on it. To the businessman, this would look like the official was being devious and breaking their agreement. Therefore, according to the criminal code of behavior, he had to be punished. Since the agreement was informal and not recorded, it was impossible to bring the official to justice through the courts, so the businessman would organize a contract killing. Since the official did not act according to the law, then he should not benefit from the law’s protection either. Neither Politkovskaya nor Kozlov fit this 1990s scenario. Andrei Kozlov was a man of firm opinions and principles and cannot be suspected of informal dealings with criminals. He waged an active fight against illegal financial operations, and was pushing to ban those involved in machinations from engaging in banking activity. He was an honest official, and his professional activity caused serious damage to several tainted organizations. The same could be said about Politkovskaya’s work. Her articles struck at the interests of a number of institutions, so the motivations for her murder could include previous exposures of abuse or an attempt to avoid being unmasked in the future. The fact that no action was taken by official law enforcement agencies against those Politkovskaya denounced in her articles should not be taken as proof that she was “harmless” to criminal circles. Such groups dislike having attention drawn to them, and Politkovskaya’s publications certainly did that. There have been many cases in Russia when journalistic denunciations have led to guilty parties being punished months or years after the initial publication. All that is needed is a change in the personnel at the prosecutor general’s office or other oversight bodies. The obvious example is the Yukos case, which in 2003 dredged up the allegedly illegal takeover of the state Appatit factory in 1994. Officials in 2003 felt differently about Yukos than their predecessors did in 1994. To all appearances, both Kozlov and Politkovskaya died for carrying out their professional duties honestly. Nevertheless, their deaths should not be labeled as political, since their murders could not and will not destabilize the situation in the country, which is unfortunately used to hearing about high-profile people being murdered. It is more likely that the corrupt and ineffective authorities that Kozlov and Politkovskaya fought against would cause Russia’s destabilization. The murders of Politkovskaya and Kozlov should remind the authorities of one important thing, however: the crime rate in Russia is not dropping. It is true that fewer higher-profile people have been killed recently, but this does not mean that contract killings do not occur. They have simply sunk to a level where they are less noticeable to the general public. When officials or businessmen in the regions are killed, their deaths often go unnoticed. A real reduction in the number of contract killings can only be achieved by giving businesses the opportunity to work openly, transparently, with no need to make deals with criminal organizations. Reducing taxes and developing easier ways to collect them can achieve this. Creating real, workable laws, however, can only be done by stamping out corrupt officials who find new ways to extract money from businesses and introduce increasingly harsh rules for trading and banking. Watching the furore over the alleged poisoning of the former security officer Alexander Litvinenko from Moscow has proved instructive. In a satirical book popular in Russia, the president, Vladimir Putin, is portrayed as a ruthless but befuddled hood who prefaces every approach to his subordinates with the gangster intro: "Slish, bratello ...(listen, bro'...)". The readiness with which we are now willing to paint Mr Putin - and Russia itself - as this kind of pantomime villain now seems rather alarming. Don't get me wrong, I'm the first critic of some authoritarian trends in Russia. For example, I think the current campaign against minorities, and Georgians in particular, is despicable. Obviously it's deeply shocking that Mr Litvinenko is fighting for his life. And we know the Soviet Union poisoned people during the Cold War. But does anyone really believe that the Kremlin tried to bump off a low ranking former FSB officer (who was, incidentally, never a spy, and certainly not a "top spy", as some have decided) who posed not the slightest threat to the country? The people who are feeding us this line are Litvinenko's cronies: Boris Berezovsky, the businessman who lives in self-imposed exile in London, and Akhmed Zakayev, the Chechen separatist leader. Mr Berezovsky, as we all know, is Machiavelli's Prince in living form, a notorious manipulator who once pulled the strings at the Kremlin. Mr Zakayev is the Chechen rebel envoy who saw no contradiction in serving in the government in exile headed by terrorist mastermind, Shamil Basayev, the architect of the Beslan school siege. Certainly, it seems clear that Mr Litvinenko was probably the victim of a ruthless attack. But whether it was organised by personal enemies that he made as Mr Berezovsky's stooge before he fled Moscow, renegade special services who see him as a traitor, or someone inside his own circle keen to set up a supreme piece of political theatre, nobody knows. In pure pragmatic terms, however, the idea that the Kremlin gave an order to eliminate Mr Litvinenko seems highly unlikely. He just wasn't worth it. After six years living in London, he hasn't made a single revelation of note about the FSB. This is not a heroic defector. The apparent attack on a former KGB agent is the talk of Moscow on the Thames. LONDON ­ Here in Moscow on the Thames, it was a calling card from home. A former KGB agent who has settled in London to raise his family gets a warning that his name is on an organized crime hit list, then falls ill from a mysterious poisoning. Theories involving the Kremlin and sinister business figures tumble around town like blinis from a hot pan. Suddenly, the elegant Mayfair townhouses with window-box geraniums and the Chelsea gastro pubs with designer vodka don't seem so far from Russia after all. The apparent attack on Alexander Litvinenko has reminded London's 300,000-plus Russian community that the long, often-menacing arm of Slavic capitalism and politics is only a 3 1/2 -hour Aeroflot flight away. "We are thinking about this and discussing this, but to tell you my opinion, it's not just murder and poisoning ­ it's politics," said Elena Ragozhina, who edits New Style, a magazine for Russians in London. "This kind of situation exists with all countries which started new to capitalism," she said. "All new business is sometimes quite ­ not dangerous ­ but not so quiet, not so relaxed. And if you will read books about how business started in America and other different countries, you will find the same examples." Over the years, London has attracted exiles and emigrants from many lands. The 21st century so far has belonged to the Russians, many of them millionaires who brought their capital to Britain, which provided security, investment opportunities, favorable tax laws and good restaurants. "In general, the main reason people come here is safety. And we see this place as much cleaner, with a higher standard of living. There's a developed financial sector, many potential investors and partners, and a booming property market," said Dimitry Antonov, a native of Novosibirsk, in Siberia, who works for a Ukrainian oil and gas holding company in London. The businessmen who would never leave home in Moscow without a team of bodyguards often travel solo in London, he said. "It's a little bit more civilized." Except when it's not. Except when somebody eats a bowl of soup at a sushi restaurant in Piccadilly Circus and winds up having poison as dessert. Friends think Litvinenko's accusations of skulduggery by Russian authorities landed him in London's University College Hospital, where he remains in serious condition. On Tuesday, doctors said it was still unclear exactly what sickened the 41-year-old Litvinenko. Although a leading toxicologist initially said his symptoms were consistent with thallium poisoning, other doctors said Tuesday that was unlikely. But they said it could not be ruled out that he had ingested a radioactive form of thallium. Litvinenko wrote a book accusing the Kremlin in a series of Moscow apartment bombings in 1999, and was reportedly making contact with an Italian KGB expert thought to have information on the killing last month of Russian journalist Anna Politkovskaya. The Italian contact, Mario Scaramella, said Tuesday at a news conference in Rome that he had alerted Litvinenko to an e-mail he had received warning that both of their names had surfaced on a hit list connected to organized criminals in St. Petersburg. The same criminals may also have been behind Politkovskaya's slaying, Scaramella said. The Russian government has called suggestions that it was involved "nonsense," and some commentators in Russia have pointed the finger back at the tangled web of expatriate politics in London, which is at least a part-time home to many of Russia's wealthiest oligarchs and some of its most persistent political dissidents. The most famous is Roman Abramovich, the billionaire oil tycoon who started cashing out of Russia when the Kremlin began moving back into the oil industry and wound up as the richest man in England. He owns the Chelsea football club, a townhouse in Belgravia, a flat in Knightsbridge, a 400-acre estate in Sussex, three yachts and a private jet. He and others have Russified the city, a trend evident in the annual Russian Season Ball, a rush on the Kandinsky exhibit at the Tate Modern, and the $8-million diamond necklaces quickly snatched up on Bond Street. A few Russian emigres find solace not just in Britain's tax laws, which allow their earnings to sit comfortably unnoticed offshore, but in sympathetic political leaders who have resisted attempts by the Russian government to extradite its opponents. Among them are the Chechen resistance's foreign minister, Akhmed Zakayev, whom the Kremlin calls a terrorist, and billionaire Boris Berezovsky, wanted in Russia on fraud charges. The inscrutable Berezovsky, under a grant of political asylum, has used London as a base of operations for delving into countless political intrigues in Russia and Ukraine. He has bought up Russian newspapers, funded civil rights organizations and generally made no secret of his intention to unseat President Vladimir V. Putin. Litvinenko's association with Berezovsky has fueled speculation about possible suspects and motives, the most convoluted of which centers on Berezovsky poisoning him to make Putin look bad. Others see Berezovsky as the next potential target. "A person such as Boris Berezovsky, I think he might feel a little uncomfortable after what's happened," said Boris Yaryshevskiy, a political science student at the London School of Economics and president of the school's Russian Society. "But the rest of the community, who are most of them law-abiding [and not connected to politics], I think it doesn't really matter for them." Litvinkenko made the headlines all over the world yesterday. unit will investigate the case. States is not planning to request any explanations at this stage. of the Kremlin and President Vladimir Putin himself. against Western ways of thinking." floor of the hospital is surrounded by police. information convincing, but they still agreed to meet again. Litvinenko had tea with two acquaintances from Russia on November 1.
to the Russian special services. media blamed all three incidents on the Kremlin. MOSCOW, Nov 22 2006-A frenzy of accusations of Kremlin involvement in the poisoning of a Russian former spy in London suggests that Moscow is far from shifting deep-seated Western suspicions about its methods, media and analysts said Wednesday. The Kremlin spent millions of dollars trying to improve its image in the run-up to hosting the G8 summit in July, but the Western media's treatment of the poisoning of Alexander Litvinenko suggests this may have been in vain, Russian newspapers said. The "harsh" Western criticism levelled against the Kremlin over the plight of the former lieutenant colonel in the Russian FSB secret service "is due not to the intrigues of Western politicians but to stereotypes that are deeply seated in Western public consciousness," the Kommersant daily said. The Kremlin, said Kommersant, "doesn't have the strength to fight" the accusations that have appeared in the British press in recent days, such as a comment in the Daily Mail that the "tentacles" of the Soviet-era KGB "reach as far and formidably as ever". Kommersant, known for its somewhat liberal stance, acknowledged that previous poisonings of high-profile figures in Russian political life had helped fuel media suspicions. Among the alleged poisonings that have been highlighted in recent days in the British media is a reported attempt in 2004 to poison the independent journalist Anna Politkovskaya, who was eventually shot dead last month, prompting international condemnation. Such poisonings have prompted comparisons between the Litvinenko case and the 1978 poisoning of Georgy Markov, a Bulgarian dissident living in London, who was stabbed with a ricin poison-tipped umbrella, a killing widely attributed to Soviet spies. Uncertainty about the Litvinenko case means that coverage has necessarily taken place in a "fact-free environment," said a London-based public relations expert who has watched the story unfold. But he added that British newspapers may be coming to re-assess how the story was reported -- largely based on briefings by an arch-foe of the Kremlin, the self-exiled Russian businessman Boris Berezovsky. "There's a slight backlash going on in the media about the spinning, the way this was done," said the expert who requested anonymity. "There's a slight feeling that the jumping to conclusions that went on immediately afterwards was possibly not based on much real evidence." Maria Lipman, an analyst with the Carnegie Moscow Centre, said that the idea of the Kremlin ordering the poisoning was based on misunderstandings of contemporary Russia, a place where the rule of law is weak and scores are often settled violently. "We should be talking about a situation in Russia where law enforcement is not efficient, corruption is rampant and the judiciary is open to bribery. All sorts of scores may be settled by contract killings," Lipman said. Litvinenko is "a former KGB agent who turned against his country and fled and a person like this can hardly expect his life to be safe. God knows what kind of murky deals he was engaged in. He could have enemies anywhere," she said. On Wednesday Kremlin spokesman Dmitry Peskov again rejected claims of Kremlin involvement in Litvinenko's poisoning, telling AFP they amounted to "complete nonsense". President Vladimir Putin in an article in the London-based Financial Times on Russia's relations with the European Union called for a change in attitudes. "Stereotypes have little in common with reality, but their persistent influence on political thinking... runs the risk of creating fresh divisions in Europe," Putin said in the article, which did not allude directly to the Litvinenko case. But Yevgeny Volk, the head of the Moscow office of the conservative US-based Heritage Foundation think tank, was not convinced. "Russia is behaving as it did at the start of the Brezhnev era, when the Soviet Union was rich due to the oil price," Volk said. "Moscow defies the West, supports Iran, puts pressure on the media and non-governmental organisations," he said. Regarding Litvinenko, it is curious to see Justin Raimondo at Antiwar.com, who has generally had some good biting things to say about "the War Party" and NeoCons, defending Putin and dismissing Litvinenko, along with false flag allegations altogether. Justin never gets around to exactly explaining why Berezovsky would give patronage to "a raving lunatic," if that is what Litvinenko really is.